Oneota pioneer Alfred Merritt and his wife Jane built their West Duluth home (as well as a barn) on a six-acre lot just above the railroad tracks (above, date unknown). Alfred Merritt was a member of the Merritt family who settled Oneota Township in the 1850s and later helped develop the Mesabi Iron Range. Oneota became part of West Duluth when it incorporated in 1888. 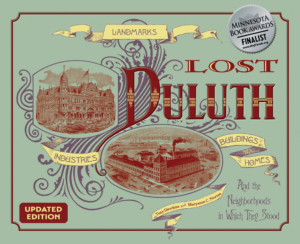 Just two years after this house was built, West Duluth joined Duluth, and the Merritt family lost their iron mining holdings to John D. Rockefeller. In 1916 the Merritts sold their home to the Swedish Lutheran Church of West Duluth, who adapted it for an orphanage. The Merritt house served as the Bethany Lutheran Children’s Home until fire struck on October 10, 1920. The building was a total loss.